ohn Lewis is having a good old fashioned clear out and that apparently means it has no room for the excellent 2017 edition of the 12.9-inch iPad Pro on its shelves any more. Not that we’re complaining when an iPad Pro price this low appears. The 12.9-inch iPad Pro is usually incredibly expensive. Actually, this version was originally £899, but today it’s available for just £649 at John Lewis. Better yet, this is for the 4G cellular version, so you can pop in a data SIM card if you want to access the online features when away from Wi-Fi. That’s entirely optional though, so you don’t have to shell out for a data deal at all if you don’t want. Plus, this iPad Pro deal is cheaper than the cheapest regular 2017 iPad Pro of this size, so you’re not paying anything extra for a feature you might not want. Why this over a 2018 iPad Pro deal? The main reason we’re super excited about this iPad Pro price is the epic saving. 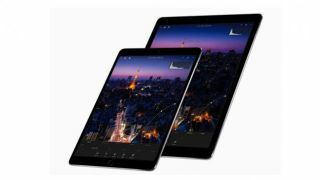 If you wanted the most modern version of the 12.9-inch super tablet, then it would cost you £949.99 at Amazon today – and that’s for a standard Wi-Fi version with no SIM card slot. It’s generally £969.99 at most stores too. Sure, the 2018 edition has those lovely curved corners on the screen and super small bezels, but internally, it’s not massively more powerful than the 2017 version. So in terms of raw value as things stand today, going for the 2017 edition is a no-brainer at this price. If you’d like to compare all your options, check out our full iPad Pro prices and deals page. If the Pros sound like they might be a bit much for your needs, you could save even more money by checking out all the regular iPad prices.